In the high altitudes of the Himalayas, grows a fungus that is a parasite to a moth caterpillar. It is known as Yartsa Gunbu, Winter Insect Summer Grass. 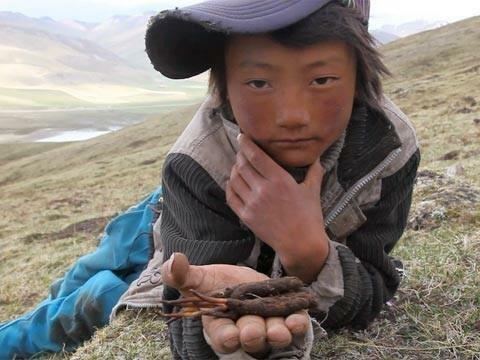 For centuries, there have been Tibetan families who have made their living by gathering and selling this fungus. Because of the difficulty involved in harvesting it along with the high demand due to its medical benefits, it is one of the most highly priced and highly valued ingredients in Chinese Medicine. It is categorized as a tonic and prescribed to boost the immune system, as well as to increase strength and virility. It is most commonly used by consumers for its aphrodisiac qualities and has come to be called ‘Himalayan Viagra’. The market among Chinese men has escalated demand for Yartsa Gunbu to the point that it is increasingly difficult to find the fungus where once it grew in abundance. This has created a market of cultivating the fungus by growing it on peas, rice or other mediums. 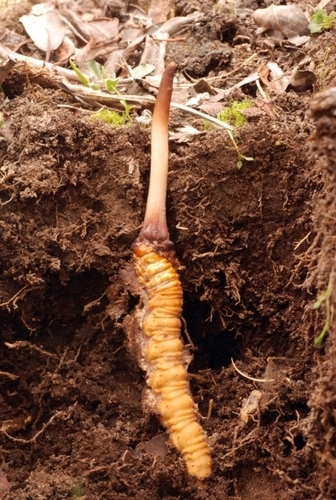 Yartsa Gunbu is the fungus Cordyceps sinensis. The pupa of the moth burrows underground in the high altitude grasslands for up to five years. During this time, as it becomes infected with the fungus, the caterpillar moves closer to the soil’s surface. Eventually killing and mummifying the caterpillar, the fungus fills its entire body cavity. In the Spring once the snow melts, the fungus grows from the forehead of the caterpillar up to six inches above the ground. It then releases its spores which will wait for their future hosts. Harvest is by hand and begins in May and lasts for 5-6 weeks. In 2013, over 53 tons of yartsa gunbu was harvested. Since 1997, prices have increased by over 500%. A single average-sized piece can cost over $16. A month’s supply of 30 pieces can cost a consumer over $465.00. This is the world’s most expensive fungus. Because of this, yartsa gunbu is not only used for its medicinal value, but also as a status symbol to show one’s wealth. In recent years, areas of Tibet have begun to enforce rules that no outsiders are allowed to harvest or export the fungus. Posted on May 14, 2014, in Tibetan Culture & History, Uncategorized and tagged tibet, Tibetan culture. Bookmark the permalink. 1 Comment. Simply amazing. Thank you Raven.